Now that you have spent some time meditating, it’s time to get active. Almost every Jedi Knight is incredibly fit (and those who aren’t channel the Force well enough that they have the benefits of it). They flip around, do cartwheels, and triple-axel spins. It sure seems like nothing is too complicated for a Jedi. But you can’t start out doing that. Despite letting the Force flow through you, you have to build up to where you can out-acrobat a Sith Lord. So how do you, as the aspiring padawan get to that level of fitness? Exercise! And like we learned in The Empire Strikes Back, Hiking is a good place to start because long distance walking has been proven to reduce stress, prevent cancers, and lower blood pressure. Given that you’re here at the Jedi Temple and just setting out on your journey to knighthood, it might not be possible for you to hop in an X-wing and travel halfway across the galaxy to Dagobah. That’s okay. Jedi Master Yoda was totally onto something when he was training Luke to hike through the swamps, though. Plus, long distance walking tends to be very meditative, so you’re able to become closer with the Force even as you’re getting stronger, fitter, and burning calories. Luke starts off by running, and every padawan knows that cardio exercise is a good way to go if you’re trying to be healthy and burn calories. But running isn’t the only way to get cardio, despite what most people seem to think. You can walk–even long distance walking, if you haven’t considered that–but more importantly (for this lesson at least) is hiking. And you can certainly do the same thing, whether you’re on a mission down in 1313 on Coruscant, saving the Ewoks on Endor, or hiking the Appalachian Trail, there are few forms of cardio that are as easily adapted to any level of fitness–from padawan to Jedi Master and everything in between. It’s also easy to underestimate the calories burned walking, so it’s easy to use hiking for weight loss, too. Especially if you do like Luke Skywalker and carry Yoda on your back. 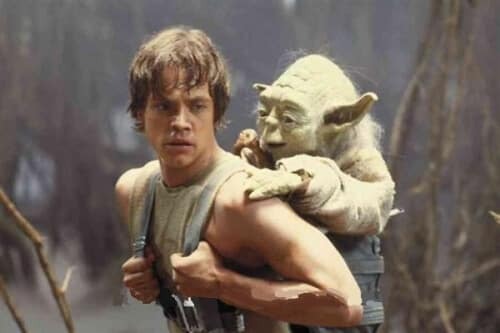 Since none of us have Master Yoda living in a hut your back yard (which is totally unfortunate that we don’t), we have to resort to wearing a simple backpack (which Luke also does at various points in his training, so at least there’s that). The military has been training its soldiers with weighted backpacks for years (these are often called ruck marches). However, even though the calories burned hiking with weighted backpacks can be much higher than if you’re hiking without one, it’s also harder on your knees and ankles if you don’t take the right precautions and do it right. Of course, if you’re really looking into how to be a Jedi, you can go all out and buy a Yoda backpack to fill up with your essentials. To start off, you’ll want to begin with lighter weights. Typically, 5-10 pound weights are the recommendation for beginning hikers, and you can begin adding weight as you become more proficient. That may not sound like a lot, but when it comes to hiking and long distance walking, you have to multiply the time spent doing it with the weights. It’s much different to hike miles with 10 pounds than to walk across your living room carrying a box. Even a short hike can be good exercise, and you’ll get enough calories burned walking to make it worth your while. Just load up with a few bottles of moisture-vaporated water or blue bantha milk, a sandwich for lunch, and couple of protein bars. While hiking can be rigorous and you can totally burn calories hiking, you have to make sure that you go at your own pace. If you don’t, any old Sith Lord will be able to ambush you, steal your lightsaber, and leave you defenseless in the woods. No Jedi should find herself in such a predicament! So be mindful of your surroundings. Of course, it’s entirely unlikely that you’ll get ambushed by the Dark Side unless you’re hiking in a galaxy far, far away, so you don’t always have to be on guard. Remember that hiking can be leisurely and relaxing, too. Just don’t expect to burn as many calories as Luke did in the swamp. You’ll still burn enough calories as you hike to make it worthwhile exercise, whether you’re going for leg strength, weight loss, or cardiovascular endurance. So, young padawan, go out there and enjoy nature. 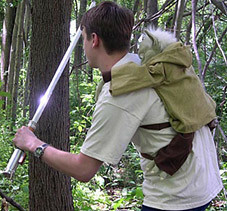 Strap Yoda to your back and hit the trails. May the Force be with you! If you’re not going to be running and/or on surfaces that are safe enough, you can babywear instead of getting a weighted backpack. You can look even more like Luke (well, without jostling around the baby) and, if you are regular, the weight will grow with time, no need to remember to add a few more pounds in the backpack this week. Carriers recommended for hiking are: Soft-structure carriers (look for something ergonomically correct), mei tais, wraps. For more info, I’ve always found the ladies (and gents) of thebabywearer.com are very helpful. That’s a really interesting idea. I know a friend of mine runs with her stroller and pushes her son. I’m going to point this out to her and see if she’d be able to wear him (their sizes may be incompatible at this point). My issue would be jostling–I am not a stable runner.